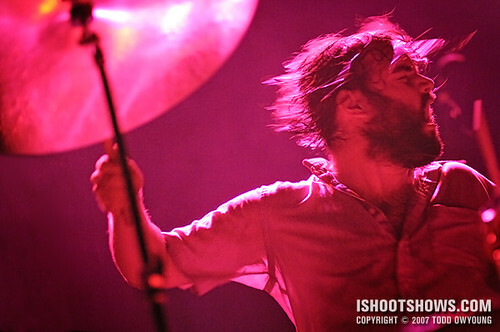 MewithoutYou‘s performance at the Pageant in support of Brand New was a quick half-hour set that found the band playing in a variety of dim washes as they brought a surprisingly raucous sound to the expectant crowd. 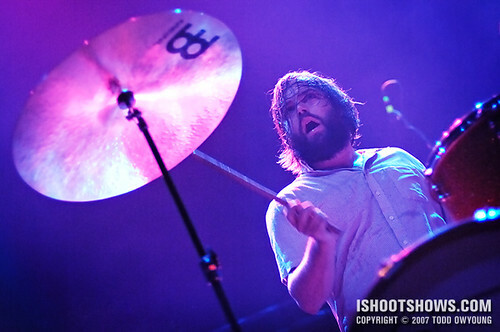 Visually, the performance was dominated by drummer Rickie Mazzotta, who looked like a cross between Jack Black and Animal as he hammered away on his kit, mugging all the while. The primes came out for this performance in force, as f/2.8 was about three-stops too slow even when shooting at ISO 1600. The Sigma 30mm and Nikon 50mm lenses came into play, and even shooting wide open at f/1.4, these lenses were struggling in the failing light. In addition to explosive bursts of back lighting, the lighting shifted rapidly between red, green, and blue/purple washes, each with slightly varying intensities. In trying to deal with the mercurial conditions, I let the shutter speeds slide and relied on the D2X's 7-fps burst mode to increase the hit rate for a few of these sequences. Invariably the strong backlighting shots were grossly overexposed, but the technique delivered for a few shots of Mazzotta. 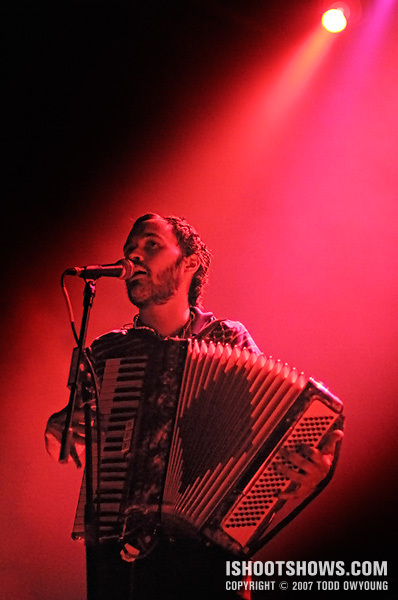 Singer and accordionist Aaron Weiss seemed content to play in the darkness, so his relative stillness while on the squeezebox provided the best opportunity to make an image. Again, a slow shutter speed, shooting wide open, and bursting helped deliver in what was otherwise abysmal light. Wow. You know, I wouldn’t have been able to tell that the lighting was that bad except for that last image. Great capture despite! The last shot is the Nikon 50mm f/1.4 at f1.4 and 1/50 sec. I think the RAW was pushed just a bit in Capture NX, too. Not so bad, but with ISO 1600 as the cap with the D2X, but not great. Looking forward to ISO 6400 and 12800 on the D3, just a little.